What’s wrong with having meters? Aye, they said that use of water increased by 10 to 20% during the cold spell…. not at all mentioning that the entire country was practically housebound for those two days. So, of course consumption would increase. It’s called softening-up opinion, manufacturing consent or creating a repeatable narrative that makes any deviation an act of irrational leftism..
another classic is “Strategic Defaulters”, has oft been peppered into the public conversation before the yeomanry come in and kick people out of houses..
Why would consumption increase of your are at home? Do you wee more at home? Did you drink more tea? @Cian, people at home for longer means more flushing and kettle filling as oppose to going to work for half the day. Surely they still go to the toilet and make tea in work? “Household” consumption increased, apparently, or that’s what they said. OK, I didn’t realise it was “Household” consumption that increased. What sort of consumption did you think it was? I”ll try to keep it short. Answer :- Absolutely nothing! No Problemo. At the moment here in France I have lived with water meters for over 30 years. Here the water sources belong to the commune and each commune chooses which company will ensure the supply. We own the water and we pay for the delivery, maintenance and investment for the future. In Eire you pay for all that but if your neighbour has five teenagers who shower three times a day but you live alone you are paying for one of those showers. Single elderly people paying for other people’s wasteful ways. Where’s the encouragement to save water? Committees create committees Ad infinitum and all their “expenses” come out of your pocket. Use less water pay less rates. That’s all well and good info, but it doesn’t answer why there’s an apparent issue with meters. Fair enough. So let’s slap a 10 cents in the euro tax for water and waste engineering instead of pretending that the pittance gathered from a miniscule proportion of VAT will do the job. did I miss the Solidarity ‘Advertorial’ tag anywhere? Well you could always pick up your local paper for the latest FF approved content. If your tastes run to that. Or rather… FG approved content. But then, they’re rather interchangeable, aren’t they? I agree that having meters isn’t a bad thing if you could use it to spot leaks etc. This was an interesting piece. I found myself nodding along to a lot of it. 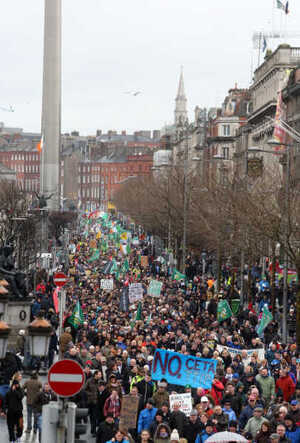 It’s the crypto-communist Greens and globalist warming cultists who’ve been the biggest pushers of water charges. The Greens get to needlessly put hair-shirts on everybody and the globalists get to sell off our vast fresh water resources to O’Brien or the like. I’d actually like to know how much water I use, I think most responsible citizens would. surely the obvious solution is to metre the water but give a generous allowance. no doubt someone will shout at me for saying this so let’s make it a very generous allowance. General taxation shouldn’t go to filling swimming pools under Ailesbury Road. So care about water wastage? Rest assured the gov cudna give a flyn about conservation. be on par with the gov’s current allowance limit charges and forever rise. The gov will have washed their hands of it.. and nests will have been feathered. Under privatisation waste will not reduce, pipes will be not be receiving upgrades an sooner. The next avoidable big pipe burst will be allowed to happen as a media vehicle to sway average joe. Why do you need to know how much you use, what difference does it make? Why can’t you simply make efforts to us as little water as you can? Not having a meter doesn’t prevent you from taking conservation measures now. It can help to spot leaks though, tbf. This is true. But many people have dripping taps and don’t bother to fix them. There is a cost with fixing the tap and no cost to leaving it drip. Yes, some people will notice the drip and fix it. But others won’t bother. If you meter people then they are made aware of the amount the use – suddenly the drip becomes more important to them and (some of them) will fix it. Thats a very cynical view, there may be a few people who would behave like this but I find it hard to believe that it would be more than a tiny percentage. Another links suggest that 10% of US homes have a leaky faucet. Irish water say that 1% of homes have leaks that account for 15% of water consumption. i had a leaky tap once for about six months. not that i wasn’t bothered fixing it, i didn’t know how to. i made an effort to get a plumber but i forgot and was out when he called. then a gay friend of mine fixed it – in around 30 seconds, using his hands, a tea towel and assorted cutlery. i felt a small bit emasculated, but pleased at the same time.i know this isn’t really what we’re talking about. Remember we all used to use plastic bags for our shopping? It was wrong and bad for the environment and created a lot of litter… but it was convenient. We, collectively as a nation, didn’t decide to “take conservation measures” and start bringing cloth bags with us to the shops. No. It was only with the introduction of the plastic bag tax that we changed our behaviour. I may be cynical, I don’t think (most) (Irish) people will change their behaviour unless there is a direct consequence on them for not doing so. I agree. By nature, humans go for convenience and it is a small minority whose conscience really pushes them to make sacrifices of their time/convenience/purse for the planet. Usually, they have to be incentivized by it either a. being made legally compulsory or b. costing them more out of their wallet not to do so. There is no reliable way to find leaks in water mains in residential properties without water meters. There was a leak under this property in Clare that was wasting 500,000 litres per month. This leak in Westmeath was wasting 30k litres per hour – neither of these would have been discovered without metering. Oh dear! You shouldn’t be dragging up the fetid corpse of the Irish Water/Fine Gael/Labour propaganda and lies that was regurgitated in the D O’B media as nausem . It led to half a billion euros of squandered tax payers money spent on useless faulty household water meters installed by FG’s pet cronies ! If you are really worried about leakage you don’t pee away tax payers money on such meters, you repair the pipe network. If you want to detect leaks then district water metering is far more efficient and cost effective than installing dodgy domestic water meters in every household. Excellent article by the way…. 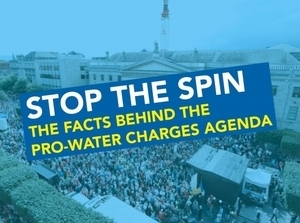 Water charges were being brought in not to conserve water but to privatise it. And we all know who would have purchased it. I never paid my bills and took part in every march but I am in favour of meters and billing but not to make a billionaire richer. Water has to be state owned forever. Unfortunately it has led to under investment in water over the last 30-odd years, so it’s not sustainable. There are a lot of people that have wells and private water schemes, so it’s not fair or equitable. It doesn’t have to be fair or equitable. The key point is Murphy’s voters cant be asked to pay for it. Tis the exact same as Leo looking for tax cuts for his voters. 1)Actually the LAs had 660 different contracts and water conservation projects on the go by the time IW set up and many of these transferred to IW! Note:They state that these AC pipes are resistant to corrosion both internally & externally & able to withstand high internal pressures etcThey state that these AC pipes have contributed to high quality water& they have a permanently smooth internal wall so pumping costs less! 4)As for private wells&private water schemes,they do get Government subsidies even re wells!Ireland incurred fines for septic tank failures re pollution & had to commence septic tank inspections & rules.Water users on public supplies didn’t complain about these fines! 11% of people have wells according to Dept of Housing,Planning&Local Government & they can avail of subsidies of eg 75% costs re private wells. 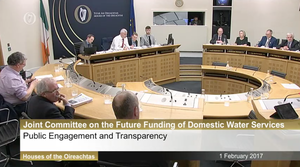 9% of people are in Group Water Schemes according to saw Dept and in January this year it was announced that “Group Water subsidy per house to go as high as €281 Irish Examiner &60%-85% increase in maximum subsidy per Group Water Scheme. I get the paranoia about who owns water upon a Greece situation but political careerists are just as disingenuous as two grand a day consultants. Irish Water calling county councils to account for their individualist approach to commercial rates is good stuff. More of this please. Shannon and forget about the leaks. water and if it could be got away with for a third time. Srt8 up yes/no, if Irish Water was guaranteed public ownership would you support it? As part of the EU-IMF bailout agreement, the FF-Green govt committed to raising 250m in new water taxes to strengthen the tax base and appease the IMF philosophy that privatisation is the most efficient outcome. Irish Water was set up for this single purpose and I couldn’t help but notice that water quality wasn’t mentioned anywhere in their mission statement. It’s very hard to move beyond that…all else aside.